Since 1990, scientists have used complex models to predict how climate change and manmade greenhouse emissions will affect the world. But a team of experts - including an astrophysicist, statistician, and geography professor – has claimed these models ‘very greatly exaggerate’ the effects of global warming. The study, published in the journal Nature Geoscience, provides more confirmation the climate models are running too hot and could not predict the 15-year “hiatus” in global warming. 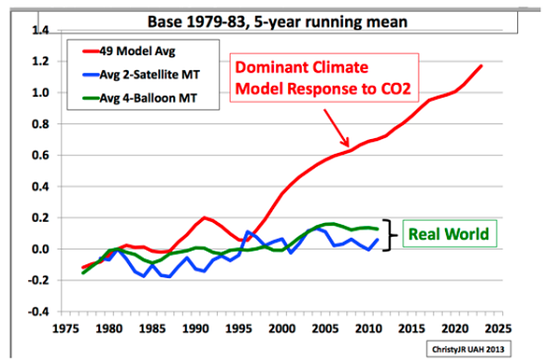 “We haven’t seen that rapid acceleration in warming after 2000 that we see in the models. We haven’t seen that in the observations,” Myles Allen, a geosystem scientist at the University of Oxford, told The Times on Monday. Predictions of unprecedented rainfall extremes in the 20th century driven by global warming turned out wrong, a study said Wednesday, casting doubt on methods used to project future trends. A massive trawl of Northern Hemisphere rainfall data for the last 1,200 years revealed there had been more dramatic wet-dry weather extremes in earlier, cooler centuries before humans set off fossil fuel-driven global warming. This is problematic, said a study in the journal Nature, as the same data models used to anticipate that global warming would cause record rainfall extremes in the 1900s, are the basis for projections of things to come. A new Yale-led study estimates that there are more than 3 trillion trees on Earth, about seven and a half times more than some previous estimates... The new insights can improve the modeling of many large-scale systems, from carbon cycling and climate change models to the distribution of animal and plant species, say the researchers. The new Stevens paper has been described as a “game-changer” by one expert in the field, Nic Lewis. According to the IPCC’s models, the effect of aerosols on climate could be as much as 4.5 degrees C. But Stevens paper suggests that this is a considerable overestimate and that the reduction they effect on temperature cannot be more than 1.8 degrees C.
While the average of 49 AGW-model runs of the CMIP5 models used by the IPCC rises diagonally upwards from 1977 by around +1.0 °C in 2015 (i.e. today), the observational records remains fairly stable at about +0.2 °C today (Fig 2). Sept 2015: A new study reveals that the evidence for a recent pause in the rate of global warming lacks a sound statistical basis. 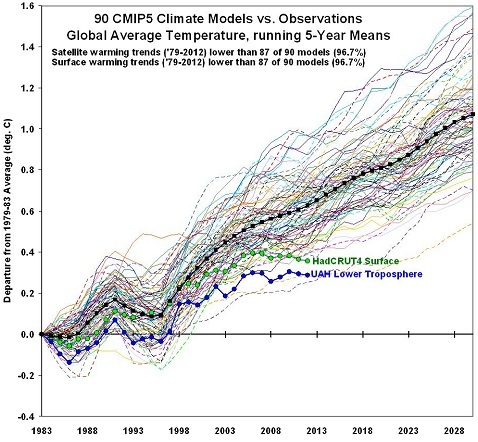 The finding highlights the importance of using appropriate statistical techniques and should improve confidence in climate model projections. Vast ranges of volcanoes hidden under the oceans are presumed by scientists to be the gentle giants of the planet, oozing lava at slow, steady rates along mid-ocean ridges. But a new study shows that they flare up on strikingly regular cycles... Scientists have already speculated that volcanic cycles on land emitting large amounts of carbon dioxide might influence climate; but up to now there was no evidence from submarine volcanoes. The findings suggest that models of earth’s natural climate dynamics, and by extension human-influenced climate change, may have to be adjusted. The fact that environmentalists have reliably been wrong in predicting the climate over the past 50 years doesn't seem to bother any of these self-styled truth-seekers. 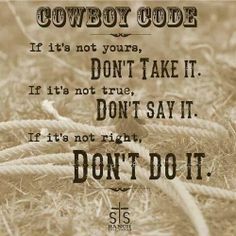 But the real action (and the evidence for chicanery) is in the computer code obtained from the CRU. 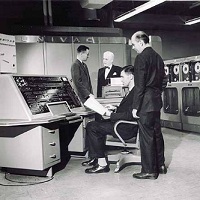 Our own computer guru Marc Sheppard, writing for American Thinker here and here, was one of the first to offer an accurate diagnosis of this fraudulent method of computer programming. Proponents further claim (and the computer models purport to show) that temperatures will continue to increase exponentially. The implication is that unless we drastically curtail human output of CO2, the "escalation" in temperature is going to get even worse even faster. Turns out that these claims are absolutely false, and the computer models have been rigged. Scientists are struggling to explain a slowdown in climate change that has exposed gaps in their understanding and defies a rise in global greenhouse gas emissions. Often focused on century-long trends, most climate models failed to predict that the temperature rise would slow, starting around 2000... Some experts say their trust in climate science has declined because of the many uncertainties. The UN&apos;s Intergovernmental Panel on Climate Change (IPCC) had to correct a 2007 report that exaggerated the pace of melt of the Himalayan glaciers and wrongly said they could all vanish by 2035. "My own confidence in the data has gone down in the past five years," said Richard Tol, an expert in climate change and professor of economics at the University of Sussex in England. Why are recorded temperatures, particularly from satellites and weather balloons, so much lower than the alarmist models had predicted? How do you explain an almost-20-year "pause" in increasing temperatures even as CO2 emissions have accelerated? Christy said he has examined the climate models used for the latest IPCC report, all of which failed to account for the lack of warming since 1996. He told CNSNews that he analyzed all 73 models used in the latest IPCC report (Fifth Assessment Report or 5AR) and not one accurately predicted that the Earth’s temperature would remain flat since Oct. 1, 1996. Several climate models indicate that in a 2 × CO2 environment, temperature and precipitation would increase and runoff would increase faster than precipitation. These models, however, did not allow the vegetation to increase its leaf density as a response to the physiological effects of increased CO2 and consequent changes in climate.